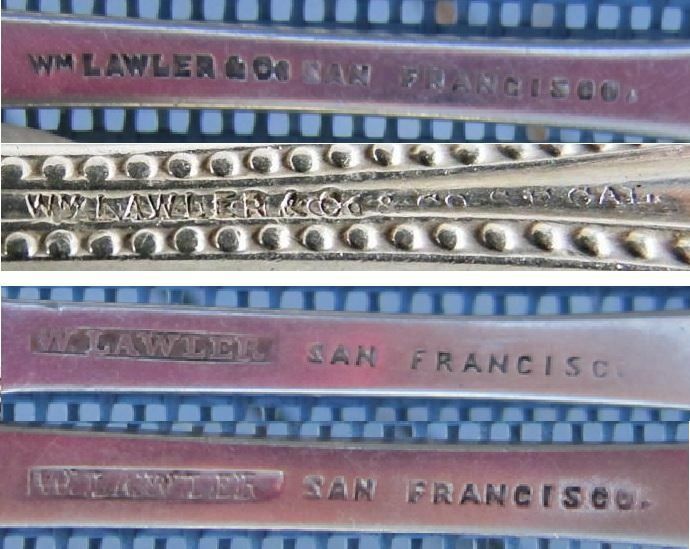 William Lawler San Francisco Silver Dates? Given that the spoons within a set match well, but don't match those in a different set, and given the simple form of all (unembellished fiddle pattern), it seems likely that some or all of these were actually made by Lawler rather than only retailed by him. All the location stamps are the same, an incise "SAN FRANCISCO." with a period at the end. However, there are two different maker (or retailer?) stamps as shown below. 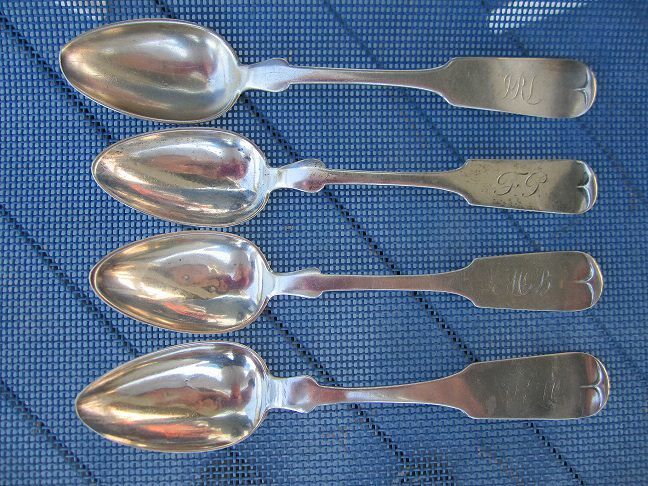 Note the top maker/retailer stamp (incise) is the same on all of the spoons except the one set of two shown at the bottom with the incuse maker/retailer stamp (but with the same incise location stamp). The second example from the top is of a spoon I thought I was going to get, but didn't, showing the incise maker/retailer stamp over another, more original stamp, ending in "& CO" and with a different location stamp, namely "SF CAL". I believe this more ornate, beaded pattern spoon was made by Vanderslice, whose maker mark was over-stamped by Lawler as the retailer.